Whether you're training for soccer, basketball, football, or just your own fitness, you need to have the proper sports training equipment. These bright orange sports cones are perfect for agility training for outdoor sports or indoor sports. Could be used as soccer cones as a soccer goal post, soccer goals for backyard, or any other form of soccer drills. Also very useful football equipment to add to your bag of fitness training equipment and speed training equipment. If you're coaching fitness, have your sports players have a running session by setting up an agility obstacle course. Sporting goods such as these sports cones are of the most efficient sports equipment and sports accessories for kids, for men, and for women! Throw this pack of 20 orange sports cones into your sports equipment set and bag of sports training equipment sporting gear. Each sports cone measures 8" inches in diameter and 2" inches in height. Many sports require a lot of practice and training, and that is where these vibrant orange training cones come into the picture. 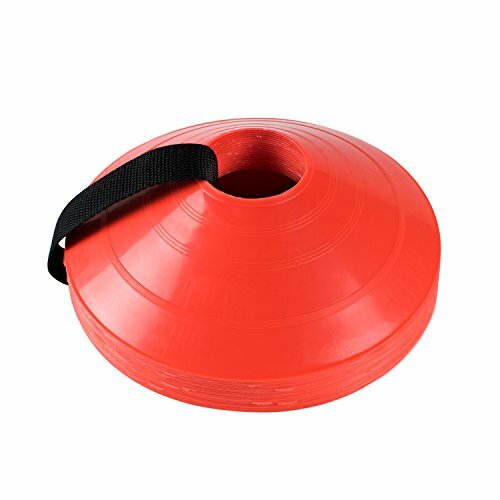 Vivid and round cones come packed together for a portable and effective pack of sports training equipment. An essential training tool and coaching equipment for a variety of sports training drills. Sports equipment for kids or sports equipment for men and women, these sports accessories are great for both outdoor sports and indoor sports. Cones are stackable for easy carring from place to place. Can be used for side-line, boundary markers, speed agility drills, obstacles, targets and many other training activities. These sports cones are made of durable orange plastic, easy to see thanks to the bright color. These make excellent soccer cones for use as a running course or a soccer goal post, agility cones, activity cones, football equipment, basketball gear and overall great sports equipment and sports accessories for anyone. Add these cones to your bag of fitness training equipment and speed training equipment to ensure you get the practive you need. Easy to carry as these cones come with a velcro strap to ensure this sports training equipment stays together. Orange sports cones measure at 8" inches in diameter and stand 2" inches tall. Every order includes a total of 20 per package. Perfect for school P.E. teachers and storing them in with other gym supplies. If you have any questions about this product by Super Z Outlet, contact us by completing and submitting the form below. If you are looking for a specif part number, please include it with your message.